I'll be honest... one deciding factor for whether or not I could picture myself at a grad school depended on whether or not the college had a decent football team (and I honestly considered applying to Oregon solely for that reason). 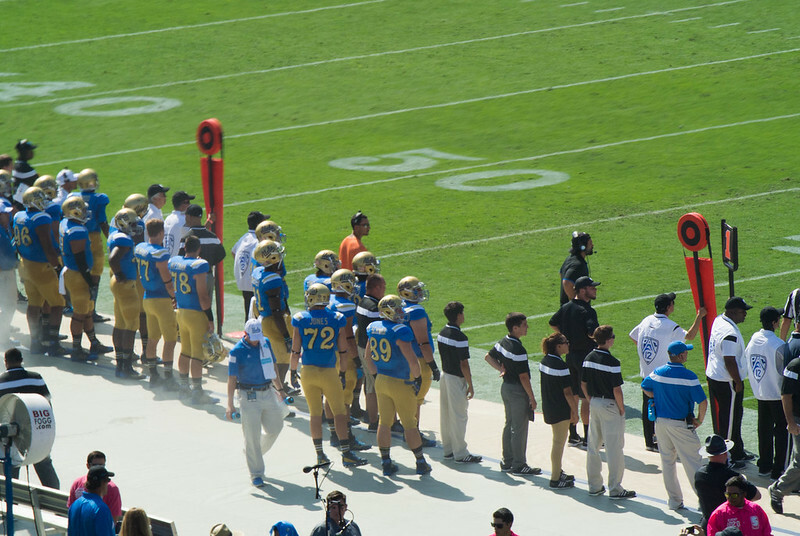 While they aren't the Clemson Tigers, the UCLA Bruins are a cheer-worthy team (who were ranked highly at the beginning of the 2014 season...), and they play in the Rose Bowl Stadium - how cool is that? Traffic wasn't too bad until Pasadena. We were sent circling through neighborhoods, trying to follow the route to parking. I think we looped all the way around the stadium first. Then when we finally arrived at the lot, it was full. So I ended up parking along a residential street, which worked out surprisingly well when we didn't have to pay $25 to park and also left the game to no traffic. We just missed kick-off, so we really missed tailgating which was a bit of a bummer because it looked pretty extravagant... we'll be sure to get there further before kick-off next time! Rather than carrying around my DSLR, I brought my Nikon 1 J1 Compact Camera with the 30-110mm lens which is lightweight and fits nicely in my purse. Now, something that I'm learning now that I'm at UCLA is that I was really spoiled at Clemson. There are a lot of "extras" that are included in the (very reasonable in-state) price of tuition at Clemson that are not at UCLA. One of those "extras" is football tickets. At Clemson, tickets are free to all students on a first come, first serve basis. 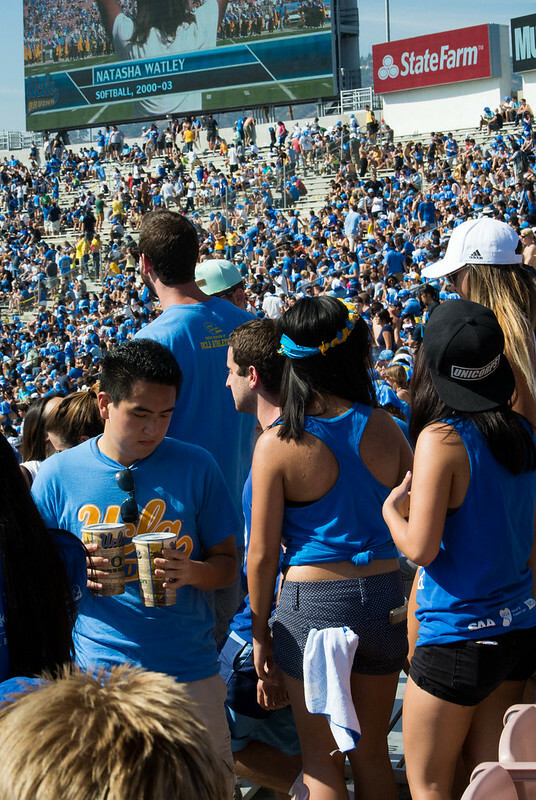 At UCLA, students must purchase tickets to football and basketball games. 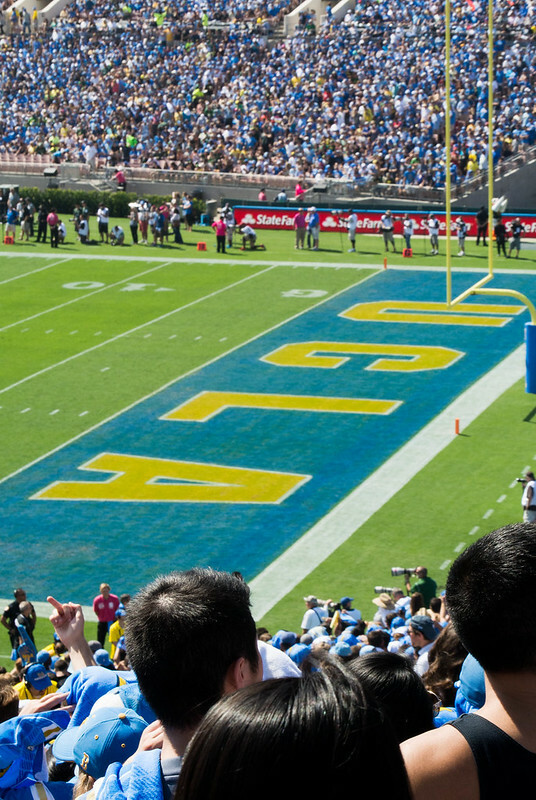 They encourage students to purchase the Den Pass which includes tickets to all home football and basketball games and is the only way to get a ticket for the USC football rivalry game. What I did not know is that at the beginning of the summer, they sent out emails offering the Den Pass at a very reasonable price of $66... but that price increases substantially over time. The cost of the same Den Pass now is $176!!! Individual game tickets for students are typically $15. 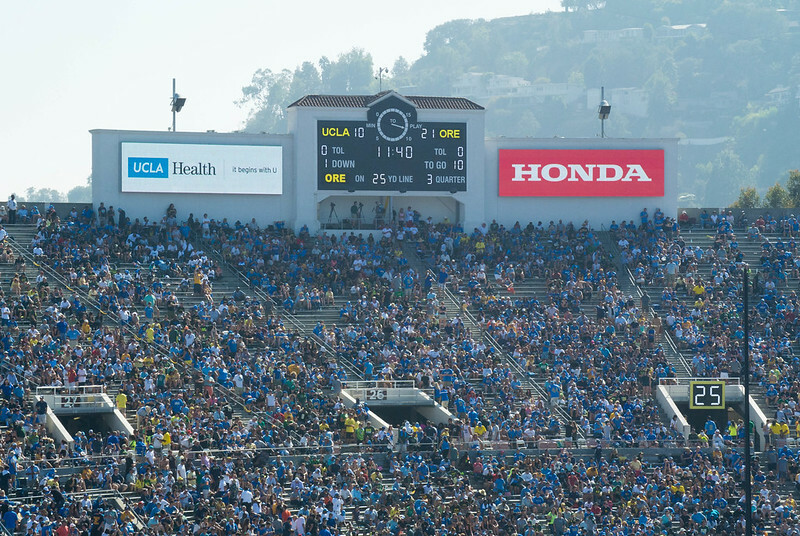 However, UCLA emailed us with a "new student free game" offer (probably to entice us to buy the Den Pass), so I was able to go to the Oregon game at no charge. So I guess they do include some things. 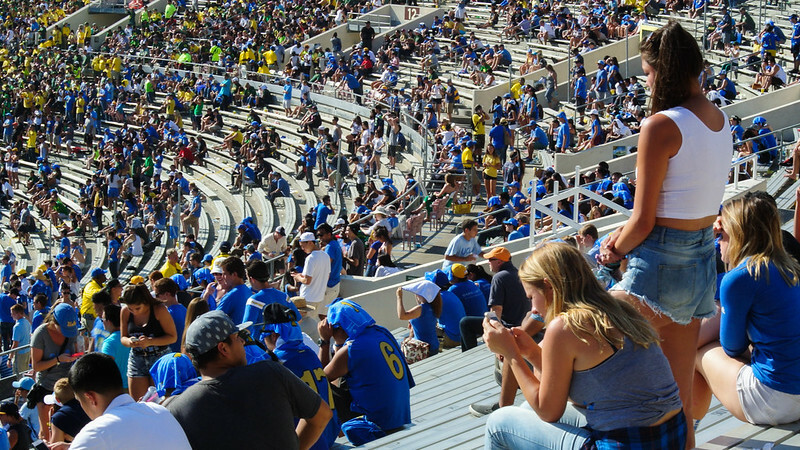 The student sections are huge, and students are seated on a first-come, first-serve basis. There are no pre-assigned seats. We were able to find seats in Section 8 which was the last section with seats (Sections 5-8 have individual seats). The other sections all had bleacher seating... which is what I'm used to at Clemson, anyway. 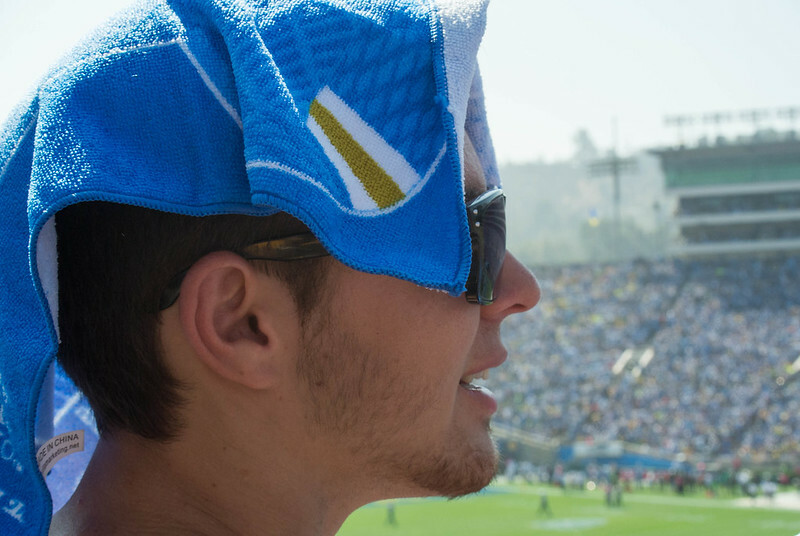 It was incredibly hot at the Rose Bowl (but it was nowhere near as miserable as the first Clemson home game versus SC State this year). 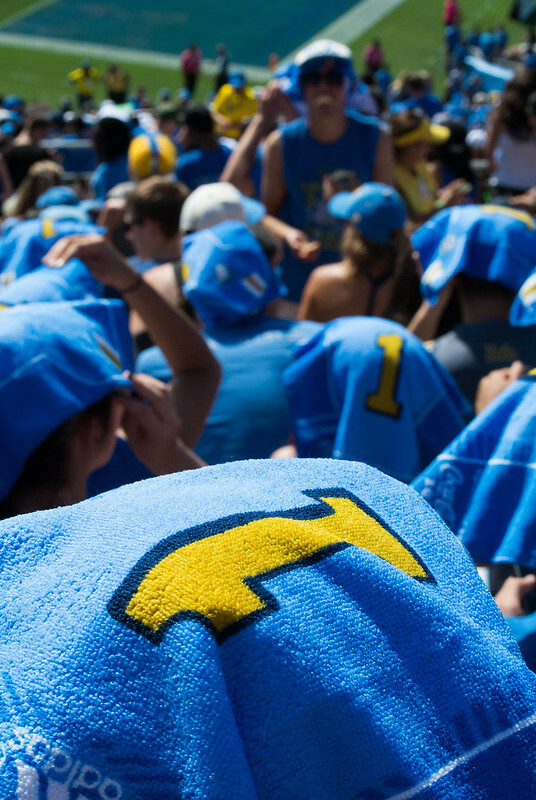 They had distributed rally towels, and all of the students were using them as hats and soaking them to keep themselves cool. The student section at Clemson is much more condensed... and I used to organize our camp-outs for tickets so that we always had a spot near the very front (and during the 2012 season, my friends and I spent every home game on the front row). 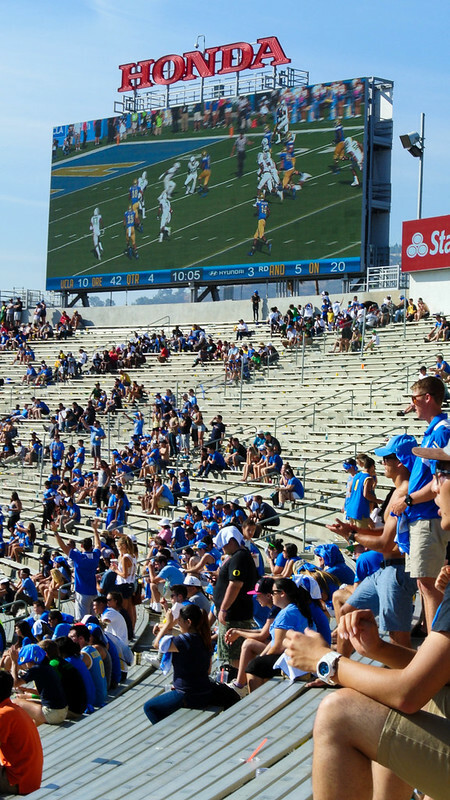 So I'm not sure if it's because UCLA's student section was over twice as large, or if because I was sitting much further back, but I didn't feel that sense of community that I always experience at the Clemson games.... doing cheers together, jumping up and down and high-fiving strangers. 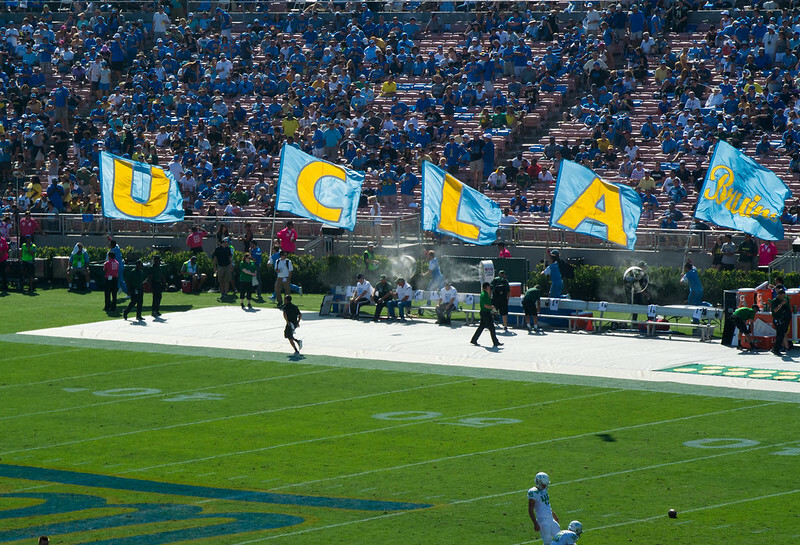 Of course, I also must keep in mind that UCLA was not performing very well. While we held up okay during the first half, Oregon completely destroyed us in the third quarter. I love learning school's unique game traditions. 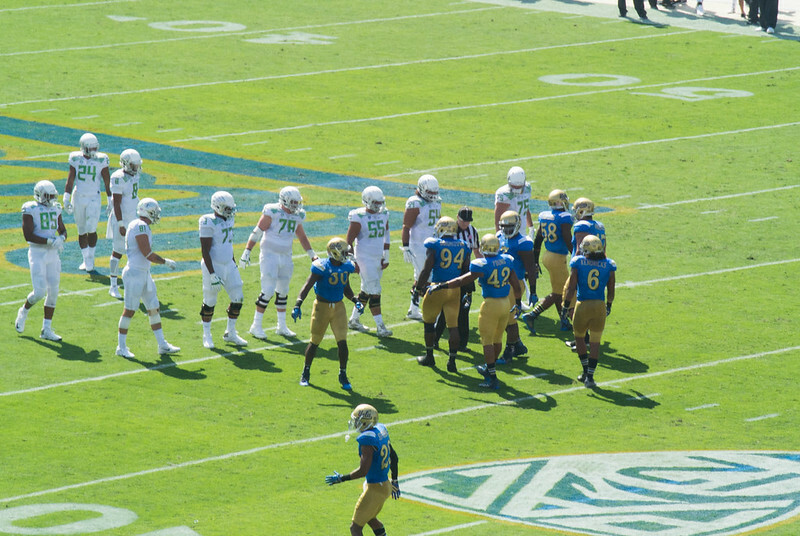 UCLA rings a bell and puts three fingers in the air when the defense holds the opposing team to third down. 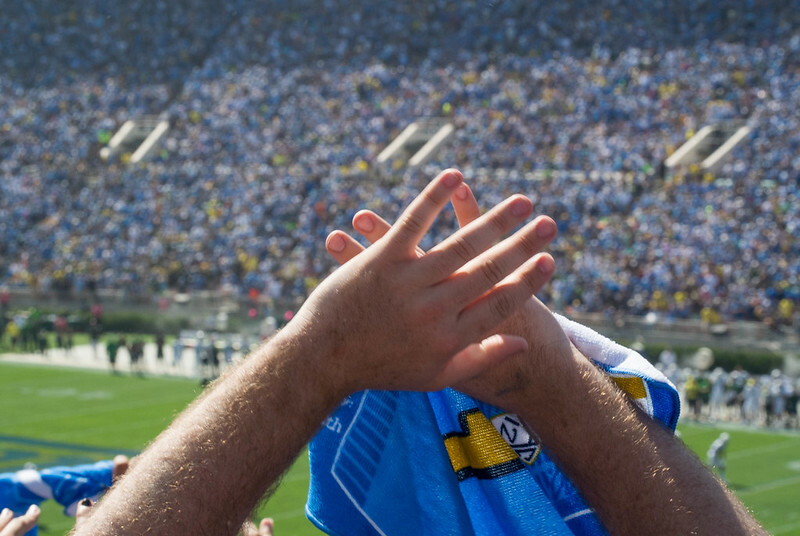 Of course, I'm not sure how effective this ritual is because once when we were all holding three fingers in the air, Oregon scored a touchdown. I wanted more cheers, though. Mostly, I wanted to yell, "Goooooo!" and point on first down. Jump up and down to Zombie Nation and sing "Woah oh oh oh oh oh oh," Shake my hand in the air on kick-off. 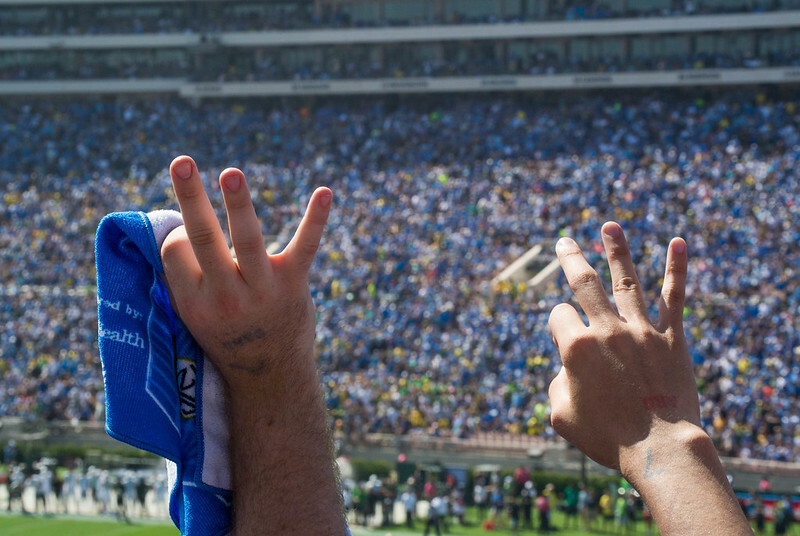 Other than the three fingers on third down routine, I wasn't picking up on much tradition. 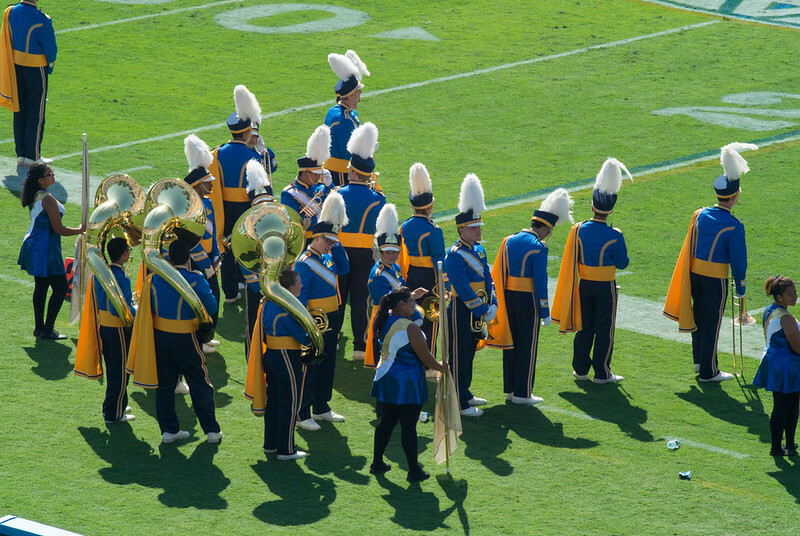 The band performed at halftime, and apparently they performed on the Amazing Race. 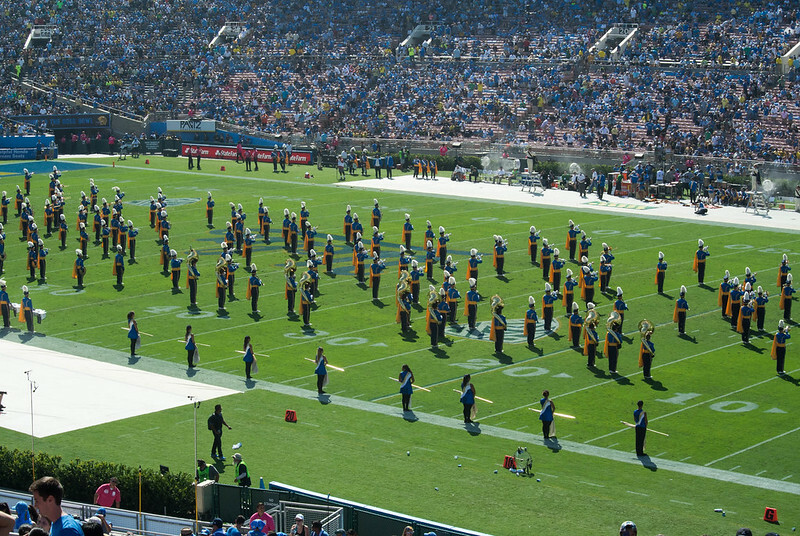 The show involved competing against USC, and of course UCLA won. It's funny because both schools I've gone to, all of the students hate USC with a burning passion. So of course I thought a lot about what to wear to the game. Friday night, I was thinking about going shopping for a game day dress.... and that's when I realized that UCLA girls might not wear game day dresses. In the south, football is a social event, as well as a time to make a school-colored fashion statement. Girls wear dresses and guys wear polo shirts and button-ups... and the poor frat boys will even go to the games in blazers and sport coats. Game day attire is very important, and I have made shopping trips just to acquire more orange and purple to wear the next day. At UCLA, this is not the case. The standard uniform here is a tank top or t-shirt with high-rise blue jean shorts. And some girls wore just sports bras... and there were several shirtless guys. Thankfully, the outfit I had come up with was a fitted UCLA t-shirt (that Dad bought me at open house) and a high-waisted blue jean circle skirt. Once we started getting our asses handed to us, the student section cleared out. 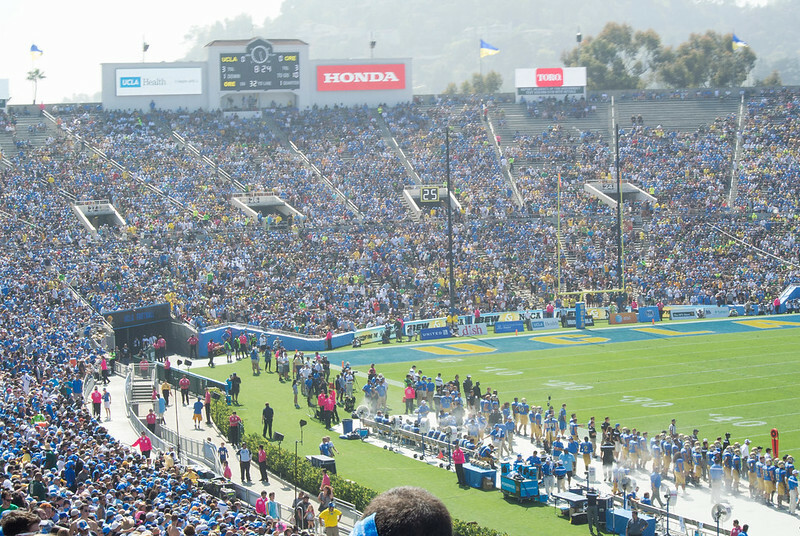 So it sucked that we lost, but playing in the Rose Bowl stadium was pretty cool. 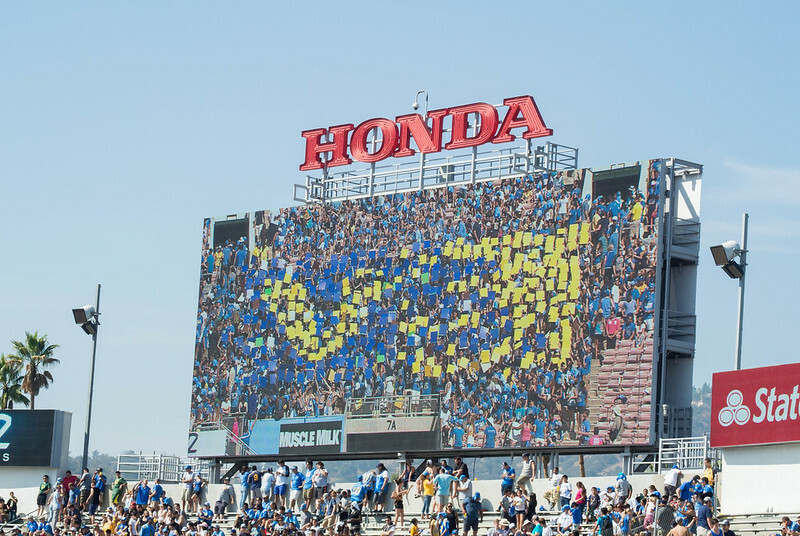 And next time, I need to get there in time for Bruin Walk before the game.